Although research suggests that tobacco smoking has been around for as many as 7,000 years, it wasn’t until the 16th century that the cigar, as we now know it, came to be. The first cigar smokers in Europe were French and Spanish sailors, but the trendy cigar quickly spread in popularity to England as well as the New World. Today, many cigar aficionados believe that the best cigars come from Cuba, with close rivals coming from the Dominican Republic, Honduras and even Florida. Cigars are still closely tied with celebration, often being lit at the birth of a baby or a major achievement like a college graduation. Whatever the occasion or the origin of the cigar, we believe it should be treated well and enjoyed in perfect condition. That’s why a quality humidor is such a vital element of the cigar smoker’s repertoire. As the perfect container for fine cigars, the humidor regulates the humidity inside to protect the integrity of the cigars it holds through the use of a hygrometer. When you begin looking for the perfect humidor to give as a gift, there are a few key things to look for. First, consider the size. The humidor you choose should be long enough to fit the largest cigars in the collection as well as large enough to hold at least a dozen cigars at the same time. Some of the best humidors are made from wood, but other synthetic materials can be effective. It will likely take a place of pride in the home or office of the recipient, so make sure you pick something elegant and classic that appeals to the specific taste and style of the one receiving it. One of our best-selling humidor designs boasts a glass top, which means that you can easily look in to see what kind of cigars are on display. For a collector who possible enjoys admiring their cigars as much as smoking them, our Cabana Glasstop Humidor can be ideal. The wooden box comes in an upscale black or cherry finish, is large enough to fit between 25 and 50 cigars and even includes its own hygrometer, which lets you see the humidity level inside. For seriously stylish individuals, our Art Deco Humidor is an incredible choice. The interior is lined with steel, which means that the hygrometer, humidifier and scissors for cutting the end off each cigar can attach magnetically to the inside of the lid. The large size and three distinct compartments can easily hold up to 150 cigars at a time. For a new graduate or someone who just received a major promotion at work, we strongly recommend the Cherry Wooden Desktop Humidor. Lined with Spanish cedar and boasting a beautifully polished cherry exterior, this humidor is a great starter size that can hold between 50 and 75 cigars at a time. Simple and sleek, it boasts a discrete hygrometer on the inside lid. 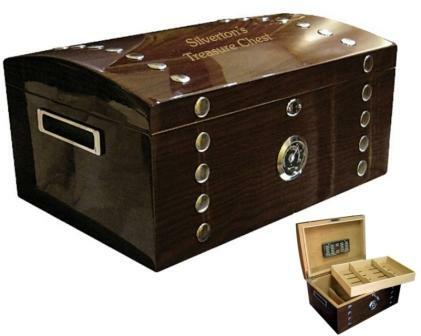 For someone who believes their cigar collection truly is a treasure, our Treasure Chest Humidor is the perfect gift. 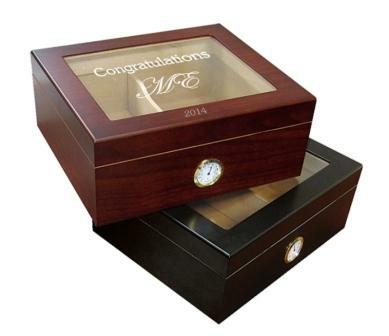 Made of Spanish cedar and polished to a stunning piano finish, this large humidor can hold up to 150 cigars. It boasts a domed lid, a removable tray, silver stud accents and even a lock and key to protect the tobacco-filled treasure. Any of these humidors make a spectacular gift for a cigar enthusiast. 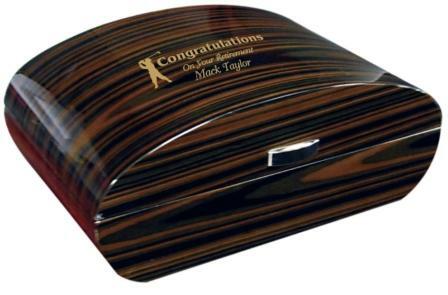 To make it a truly memorable, we will engrave a message, a date or a special phrase on the lid of the humidor you select. We’ll customize your gift with our artisan touch so that it’s more than a wonderful gift – it’s a wonderful customized gift! Place your order now so you’ll be ahead of the scurry of last minute shopping! No worries for you – you’ll be ready to bring on the holiday cheer!